These are interesting times for post-soviet politics watchers. Over the past months, we have witnessed several important political transitions in the region. In April/May, the “velvet revolution” in Armenia (followed by the elections in December) put an end to Sargsyan’s decade-long political rule. Also in April, the snap elections in Azerbaijan strengthened Aliyev's grip on power. In November, Georgia’s citizens elected Salome Zurabishvili as their first woman president. The first months of 2019 do not look boring, either. Parliamentary elections will be held in February in Moldova, among widespread public dissatisfaction over corrupt institutions and economic stagnation. Meanwhile, in March, voters will hit the polls in Ukraine, a country facing extremely severe security and economic challenges. All of these important shifts in the region suggest that 2019 may represent an interesting year as far as frozen conflicts are concerned as well. These political transitions – be them the results of elections or turmoil – have the potential to “unfreeze” the conflicts, which – despite their name – are far from static in nature. In some cases, notably in Armenia, this is already proving true. In a meeting on January 16, the foreign ministers of Armenia and Azerbaijan reiterated their willingness to prepare their populations for peace and to discuss possible economic cooperation. This is undoubtedly a positive development, which signals the decrease in diplomatic tensions between the two parties at war. Does this mean that we will see a resolution to this decade-long conflict any time soon? Probably not. Not only is this war, as well as the other frozen conflicts in the region, entrenched in extremely complex nation-building dynamics- at play before the end of the USSR but ferociously exacerbated after 1991; it also reflects regional power plays and competition between international actors. Therefore, while we should not be overly optimistic, these small steps toward a peaceful solution represent a novelty in the framework of this conflict.These political transitions could also have negative repercussions. For instance, depending on the results of the Ukrainian elections in 2019, we could see the freezing of the conflict in Eastern Ukraine, due to the protracted lack of agreement regarding the implementation of the Minsk agreements and the future of the Donbas at large. It’s also possible we could witness more episodes of direct confrontation between Kyiv and Moscow as it happened last November in the Azov sea, if the new government in Kyiv adopts a face-off strategy with the Kremlin. One key factor for these and other conflicts remains unchanged: Russia's influence. In March 2018, there was another election of utmost importance in the region: the presidential vote in Russia, which confirmed the highly expected result of Vladimir Putin’s remaining in office until 2024. How does this affect frozen conflicts? In many ways, the continuity in Putin's power substantially makes the status quo more plausible – read, no groundbreaking advancements in terms of peace negotiations. This is because of the very role that Russia aims to play in the region, a “privileged” actor trying to act as a balancer (and beneficiary) of the diverging interests of the countries at war. As Sergey Markedonov explains: “All these diverse interests limited the opportunities for resolution of political conflicts. In fact, balancing between these diverse interests for so many years turned Moscow into the “freezer” of these conflicts without any substantial change in the prospects of their resolution”. This is not to say that the Kremlin’s priorities and attitudes are set in stone. On the contrary, Russia’s position towards frozen conflicts underwent several changes throughout the years, depending on domestic as well as international factors. 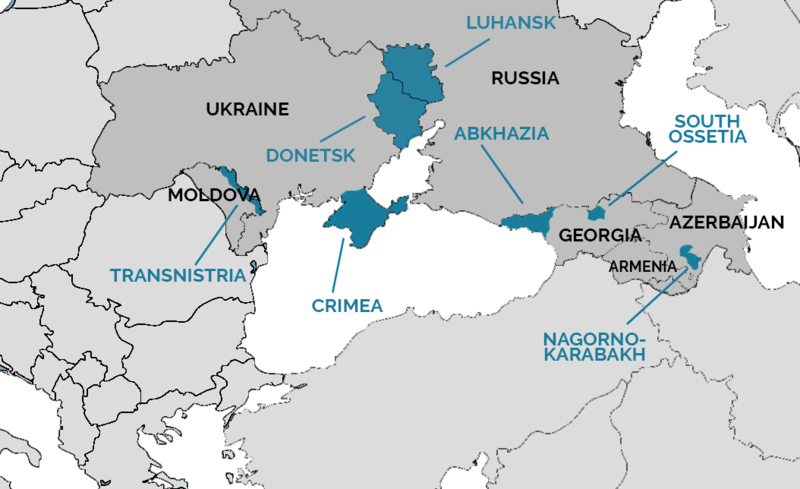 For instance, some authors claim that until 1998 Russia was supporting Georgia’s fight to preserve territorial integrity in light of Moscow’s own separatist challenge coming from Chechnya. Moscow’s foreign policy is also evolving: as a matter of fact, Russia has been increasingly involved in new theatres for power projection beyond its region. Syria is a case in point, but Russia is also expanding ties with many African countries. However, despite this “global agenda”, Russia’s disengagement in its “neighbourhood” is unlikely. In light of historical, political and economic considerations, Russia claims to have a legitimate sphere of “privileged interests” in the post-Soviet space- a concept which the EU considers outdated and dangerous and that is central to understand the current state of affairs of Russia-EU relations. This is unlikely to change in the near future. But Russia is only one of the factors at play - a crucial one, of course, but not the only variable in this complicated picture. Frozen conflicts can improve or escalate regardless of Russia’s direct action – think of the 2016 escalation in the Nagorno Karabakh. This is because these conflicts are not frozen at all. On the contrary, they are highly dynamic, which is why some experts prefer using the phrase “protracted conflicts” instead. As the authors of an OSCE report eloquently argue, only the peace processes are frozen, not the conflicts themselves. 2019 has all the ingredients to see some changes in the regional dynamics of conflict and cooperation.Time will tell whether they are for the better or worse. Frozen Conflicts in the Post-Soviet Space: What Will 2019 Bring?